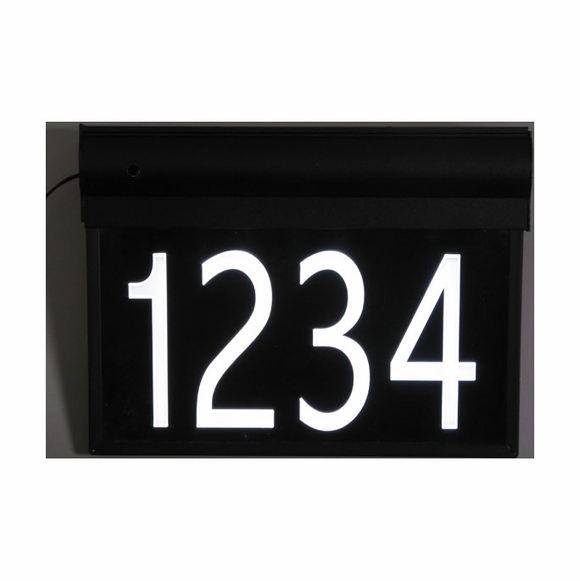 LED house number sign automatically turns on at night and off during the day. Brilliant night time illumination helps emergency services quickly locate your home at night. Long-life LED lamps with 10-year life expectancy. Address number is artistically engraved on clear acrylic with your choice of white or red night illumination. All numbers are white during the day regardless of night color. 10" x 8.5" x 1.75"D sign holds up to five 4" high numbers only. Completely weatherproof aluminum construction. Includes stainless steel screws, mounting hardware, and 12-volt adapter. 20' power cord. UL approved. 1-year mfg. warranty. Custom made. Please allow approximately 4 weeks for delivery.